I found it! 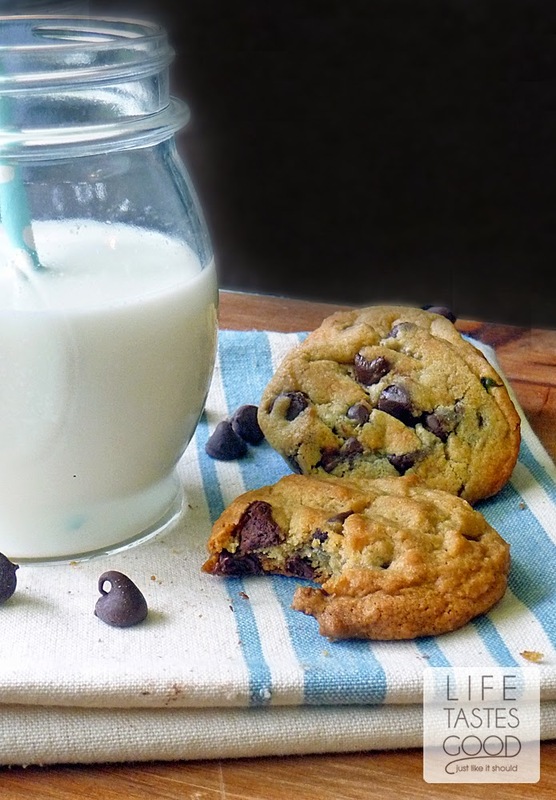 This is The Ultimate Chocolate Chip Cookie Recipe of my dreams!! It is chewy with just the right amount of crunch, and the flavor is perfect! Did you hear that? Purrr-fect!! I thought my search was over when I made the Awesome Chocolate Chip Cookies, but I was wrong :( I never would have strayed from that recipe, but I ran out of all-purpose flour one day when we had a hankering for cookies! Wait? What? How do you run out of all-purpose flour? I don't know, but it happened. It must have been fate! I didn't have high hopes for these cookies because of the bread flour and almost no white sugar. 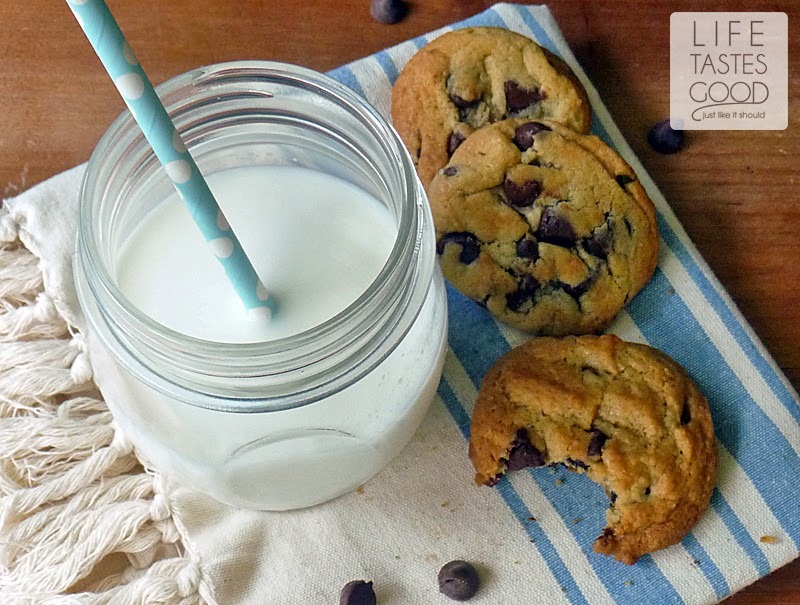 This went against everything I knew about chocolate chip cookie baking! But, again, we needed our cookie fix!! These looked beautiful when I took them out of the oven for the first time, and it was love at first bite!! I knew we had something special right then and there, and Don agreed! This dough freezes really well too. I like to scoop the dough onto the cookie tray and pop it in the freezer until firm - about an hour. Then I store the dough balls in a zip top bag until ready to use. I have given cookies to friends like this. It's so nice to have a stash ready to go at any moment, and it's nice to only bake up what you need. It's just two of us at home most of the time - if I made a few dozen cookies they would either go bad before we could eat them or, more likely, we would get sick from eating them up too quickly! 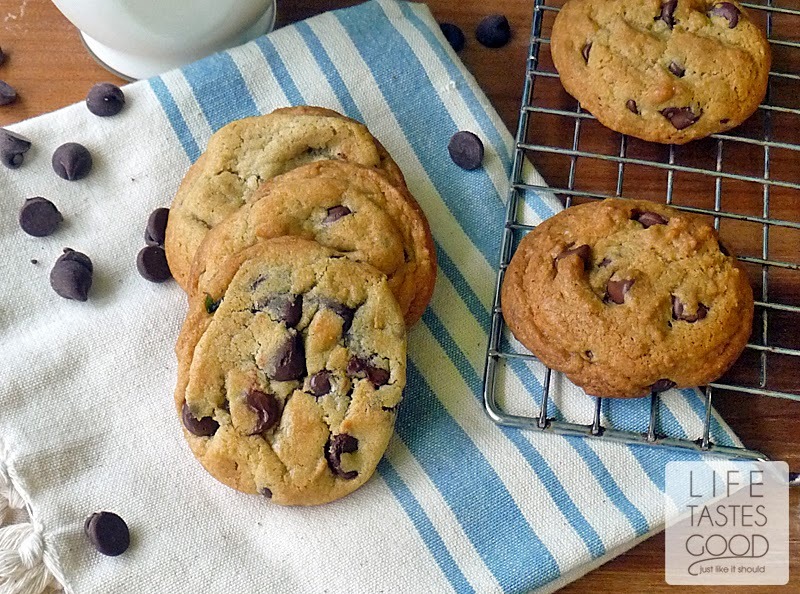 Fold in 12 ounces of semi-sweet chocolate chips until incorporated throughout the dough. Now here is the hard part...chill the dough in the fridge for at least an hour, but overnight is better. I compromise and chill the dough until after dinner and then I make 1 tray (about 9 cookies) for that night. The rest of the dough goes back in the fridge overnight. When ready to bake your cookies, preheat the oven to 375 degrees F. Using a cookie dough scoop or a full tablespoon, scoop dough onto parchment lined baking sheet. 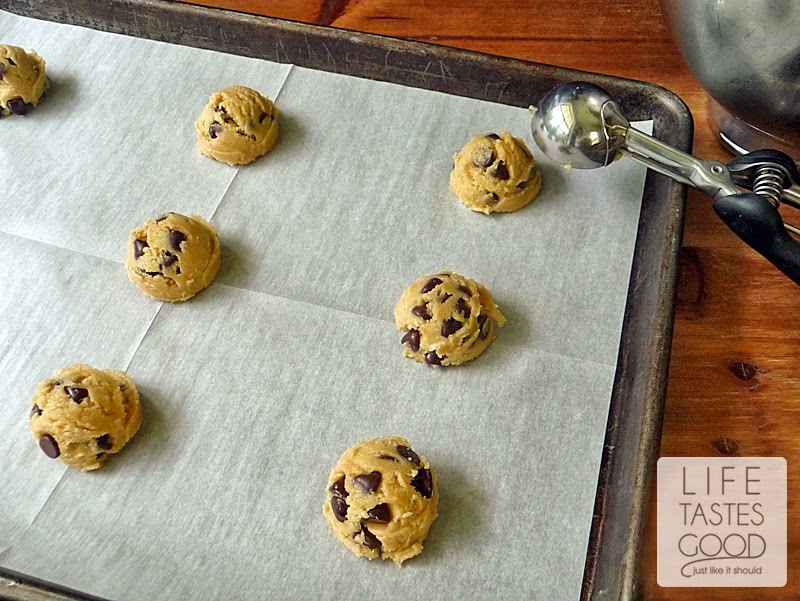 Bake in oven for 10-12 minutes or until your cookies are golden brown. Let cool on tray for a minute or 2 and then transfer to a wire cooling rack. Enjoy! OMG I love these cookies!!! I really want to try baking with chocolate this year. Hi Irene, hmmmm There are lots of things this could be. I'm wondering about the protein content of your flour. Cake flour has less protein than Bread Flour and would result in a more cake like, soft cookie. Also, be sure you are melting the butter. I definitely should have been more clear about that in the directions (sorry). I have updated it to say melted - melting the butter produces a chew. Oven temp could also be an issue - your oven might be cooler than mine, so you might need to bake them a little longer to get a slight crisp. I recommend making sure you are using Bread flour (I use King Arthur's) and melting the butter. Be sure your aren't forgetting the white sugar for a little crisp (I've done that when in a hurry - there's not much white sugar in this recipe, I sometimes forget it's there! ), and maybe increase the baking time. I hope all this helps. 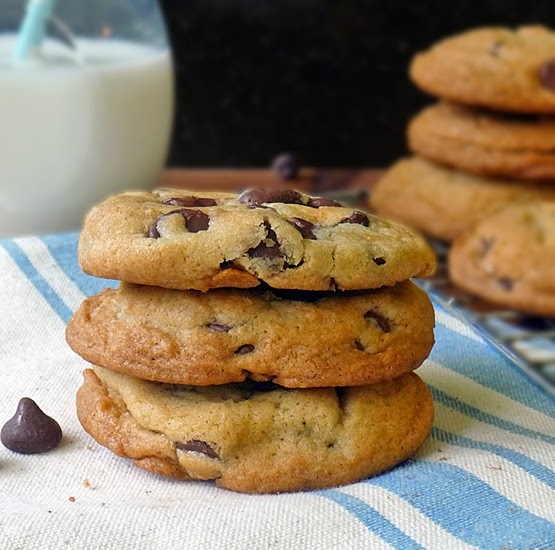 I'm always trying new recipes for chocolate chip cookies, and these are still our favorite by far. I'm actually getting ready to make some more today for a friend. Please let me know how it works for you. Good luck!! I'm glad they still liked them. I know there is only 4.5 tablespoons of the white sugar, so it is easy to forget it. When I say sugar in my recipes that is always regular white sugar. 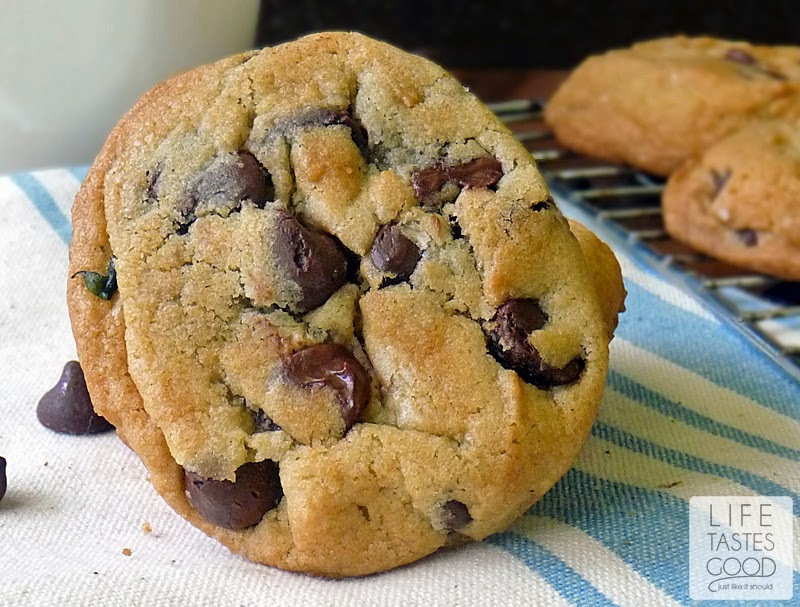 When brown sugar is needed, I will specify that - as in this recipe where there is 1 cup brown sugar which helps keep these cookies moist and delicious! I hope this works for you. Thanks so much for reaching out to me! Alina, I would stick with bread flour when making this recipe. If you don't have bread flour, then I recommend using the recipe on the bag of chips. In this recipe the other ingredients are altered to work with the bread flour to make a chewier cookie. I did not like how the cookies looked due to the melted butter. The cookies did not appear as the ones in your photos. They were tasty perhaps not our favorite though. Julie, I'm sorry they didn't turn out right. I make these all the time and they always look the same. I'm curious what issue you had with them. It sounds like maybe they spread too much if you didn't like how they looked. That could be the oven temperature or maybe the flour. I've never had that problem with this recipe. Be sure to check you used bread flour. Thanks! W@hat does the buttermilk do in this recipe. I don't always have buttermilk and could I sub milk?